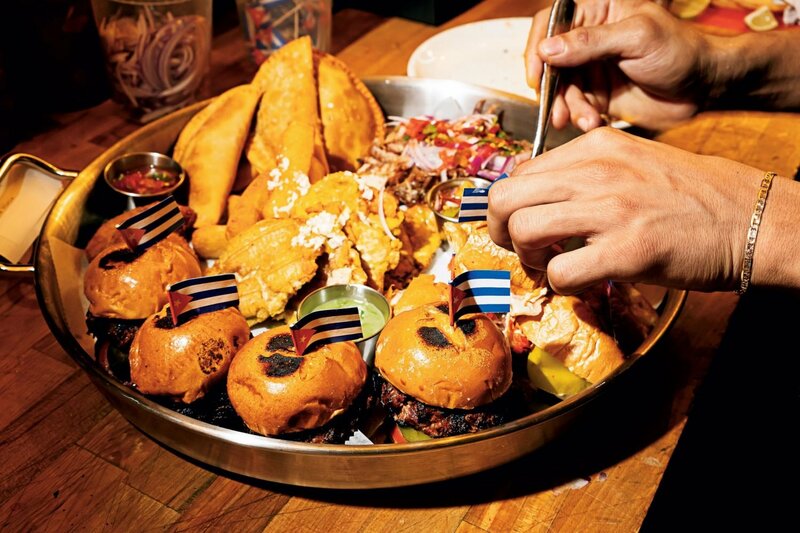 A platter of snacks, including tostones and sliders, at Silver Spring’s El Sapo. If restaurants had Myers-Briggs types, the new El Sapo Cuban Social Club would be 100 percent extrovert. The music is so loud you might wonder if dinner conversation is even possible. (Answer: You’ve gotta work for it.) The dining room is dominated by a giant mural of drunken toads. (We’ll get to that later.) Then there’s chef/owner Raynold Mendizábal. He’s the big close-shaven dude excitedly chatting up tables, shaking maracas, stirring up a drink, or zipping through the kitchen. 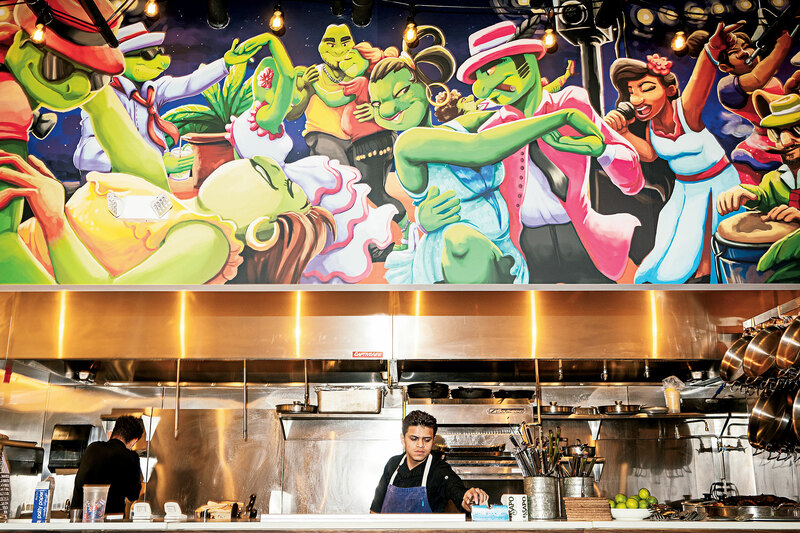 The restaurant’s open kitchen, featuring a mural inspired by the Cuban charada. 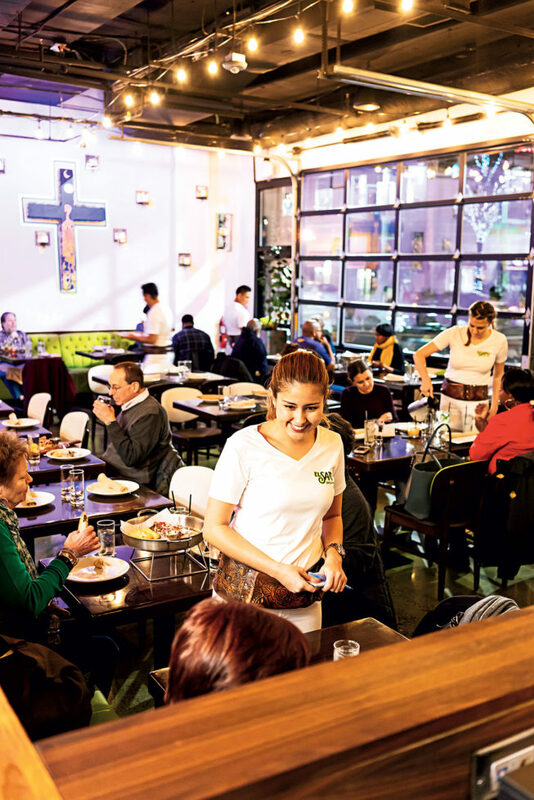 Mendizábal’s menu swings between Cuban classics (crunchy tostones with green sauce) and riffier dishes (miraculously light croquetas laced with salt cod), all served on big platters. Start with the ceviches—each has its merits, but my favorites are the classic version plus renditions made with conch and bay scallop. The raw-fish plates show off one of Mendizábal’s greatest skills—hitting your palate with just the right mix of salt, acid, and heat. But he also knows that fat sardines, given a turn on the grill, need just a little olive oil and cilantro to dress them up. Meatier dishes are less of a sure thing, at least when it comes to execution. On the one hand, there are no better beef empanadas in the area. The vaca frita, a play on the traditional fry-up of steak with onions, is a marvel. (The kitchen salt-packs brisket for a week, then braises it until the fat ripples through the meat. It’s doused with lime, and the server shreds it with a spoon.) A more offbeat creation—dried goat braised with soy sauce and honey, set atop a mound of polenta—is based on the tastes of a Santeria god. “It’s an homage to our culture, but not a direct reference like an old car,” Mendizábal says. “We’re trying to get away from that Cuban kitsch.” It’s a worthy offering. But a heap of roast pork with bitter orange lacked much savor or moisture. The pork’s flaws are masked in the strapping Cubano sandwich, which is delicious, thanks to house-made ham plus smoky-spicy mayo. Then there are the oxtails, the plate Mendizábal talks up the most: “My thing!” They’re the most labor-intensive dish on the menu, but when I dug in, the meat was so salty I guzzled my mojito to clear the taste. The dining room at El Sapo. Things look up again at dessert. Pastry chef Blanca Sanchez has been working with Mendizábal for much of his time in DC, and her creations are wonderful, whether airy churros with lemony cream or a super-sized chocolate-coffee soufflé (think brownie batter that dreams are made of). There’s an extensive cheese selection, too, and the one you don’t want to miss is a rarity called pascualete. The Spanish raw-milk cheese has been warmed, and it’s so oozy, creamy, and fatty you eat it with a spoon. On the side, guava paste and almonds. It’s meant for a big group to share, but, like many things at El Sapo, a friend and I polished off every bite. Dress: A mix—everything from jeans and T-shirts to tiny dresses. Noise level: It’s so loud that you might think the place is for dancing, not eating. 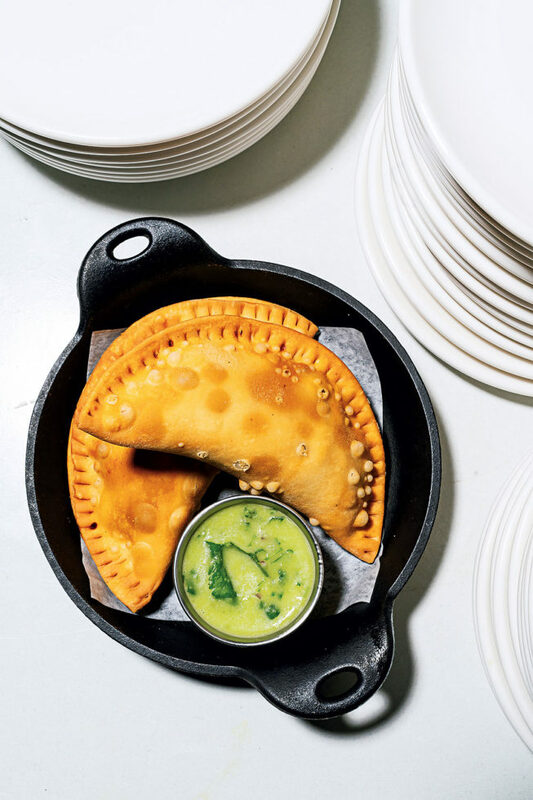 Best dishes: Classic, bay-scallop, and conch ceviches; sardines; croquetas; empanadas; vaca frita; dried goat; Cuban sandwich; churros; chocolate-coffee soufflé; pascualete cheese; rum Manhattan. Price range: Small plates $6 to $24, entrées $16 to $56 (for oxtails and vaca frita, both for two). Starters $4 to $16, entrées $15 to $30.